Here is the final installment of a 6 month cycle of studying and teaching academic anatomy. I feel I have learned a lot about drawing (not just humans) and teaching anatomy. I hope this will make my anatomy classes even stronger the next go round. I thought this might be a good time to list my favorite books for the academic study of anatomy. 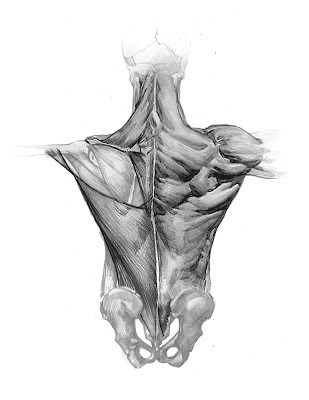 Next semester I will be teaching a "Bridgman Studies" class, I will write more about the books I reference when studying the visual side of anatomy at that time. I definitely consider these two different fields of study, and have yet to find a single book that covers both well. This book is the source book for anyone wanting to learn more about figure drawing. The author divides the study of the figure into four separate factors that are interdependent of one another. The four facets that Goldstein describes are the Structural, Anatomical, Design, and Expressive factors. A preoccupation with re-presenting such surface actualities (generally in a high polished manner) blinds the student to the geometric core of forms. Moreover, the beginners awe of the figure, which is quite rightly regarded as complex, important, and beautiful, and the subtlety with which the figure suggests its pure solids, makes an analytical search for them difficult. The Anatomical factor is comprised of a thorough knowledge of the anatomy and how this effects of the surface of the figure. Goldstein stresses the point throughout the book that no one factor is more important than the other. They all work together to create a whole image. Each contributes and enhances the others. He comments on the art students study of anatomy as being "dispassionate diagrams of the human mechanism" and that these illustrations do not breath the "living spirit" of the human form. He goes into great detail in his discussions on anatomy. He disregards all inner anatomy that does not effect the surface of the figure. These discussions are accompanied by artist's drawings and diagrams of the bones and muscles. The third factor, the Design factor, covers the importance of composition, and unity. Goldstein describes a drawings design as "the consequence of its abstract and figural occurrences - the visual nature of the tensions, movements, and the relationships that exist among the drawing's marks and meanings". He separates design from expression by saying that the above occurrences are felt by the viewer is what creates expression. I feel the figure must begin with the gesture. The gesture is the key to expression. Once the gesture and overall feeling is down, then construct the figure to fit onto this "framework" and build from there. I used to draw exactly like Goldstein said, I would start out with a detail and build from there. My drawings would grow across the paper like some fungus, rather than materializing as a whole. All my drawings then were connected, smaller visions that had no purpose as a whole. The parts didn't relate to one another and give an idea of the whole let alone an expression. I think of drawing the figure now as like building a house. You have to start with a frame before you can put the cabinets in the kitchen! I thoroughly enjoyed this book and will continue to study it from now on. I would like to, maybe, do a study in the future that revolves around the ideas presented in this book. By breaking the figure down into its component parts, it's not as frightening for me to draw now as it was in the past. Thanks Gene, I will look in that book.